Salmon is one of my favourite fish and so I’m always on the look out for new ways to do something a bit different with it. I came across a recipe in Olive Magazine this month that I new I had to give a go and whilst it didn’t need too much converting to make it lower in calories, it really needed more flavour adding. The result is my version of the recipe below! Begin by making the salsa so the flavours have time to mingle together. Literally pop the ingredients in a bowl, mix and pop in the fridge. Next pop the rice on to boil. I added a tsp of pilau seasoning to the rice for extra flavour. While it’s cooking, mix the spices together in a bowl and add the salmon, coating well on all sides (reserve a few tsps of this spice mix for later). Pop the oil in a frying pan, heat up and then add the salmon skin side down. Cook for 3-4 minutes and then turn and cook for 3-4 minutes on the other side until cooked through. Pop the salmon on two plates, reserving the frying pan. Drain the rice and then add to the frying pan pan with the reserved spices and quickly stir fry for a minute or two. This will really up the flavour. 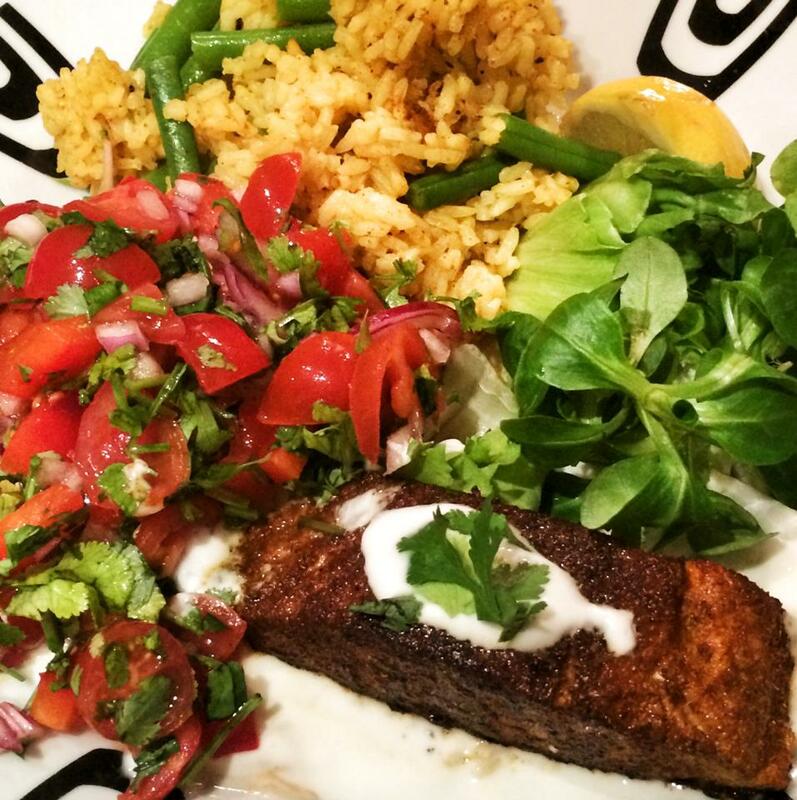 Pop the rice onto the plate next to the salmon, then add the salsa and a few salad leaves. Finish with a tbsp of natural yoghurt with a little lemon stirred in. So pleased you enjoyed Gemma! Made this recipe last week – my husband had it with chicken as he’s not a big fish eater – and we both absolutely loved it. Incredibly tasty. Thanks so much for sharing it. Yes I’d like to know well please!